As a low sodium eater, lunch is the most difficult meal of the day, especially when you are constantly on-the-go. Most people eat lunch out, during a busy work day or while ticking off a long list of errands. And for the salty population, there is a plethora of options to choose from: an overflowing turkey sandwich, a bowl of hot chicken soup, or even a slice (or two) of pizza ordered by the office. But for us, the salt-less crusaders, choices are slim: steamed white rice from the local chinese take-out, a create-your-own salad bar, or maybe the occasional French fry (thank you Frjtz). While I am thankful for these snacks, I have to be honest – sometimes my belly wants more. Sometimes I want to eat a lunch that will not just keep me full, but one that will make me smile, taste bud to taste bud. So here’s the most perfect, simple solution: leftovers. In my not very humble opinion, most low sodium dinners fare quite well the second day around (except fish). And by eating that amazing risotto you made last night, again, you not only pay homage to your hard work and save a couple of bucks, but you are guaranteeing yourself a fully satisfying, low sodium meal. On this hump-day, I give you the simplest salt-free recipe for a delicious lunch. Go ahead and plan that tupperware party, it’s time to pack up some goodies and as always, chow on. 1. After cleaning up dinner, place leftovers into a well-sealed plastic container. 3. The next day, pack the leftovers in your computer bag or purse (make sure there are no leaks in your tupperware!) and take with you. 4. Wait a few hours and around lunch, take out tupperware, reheat, and eat. 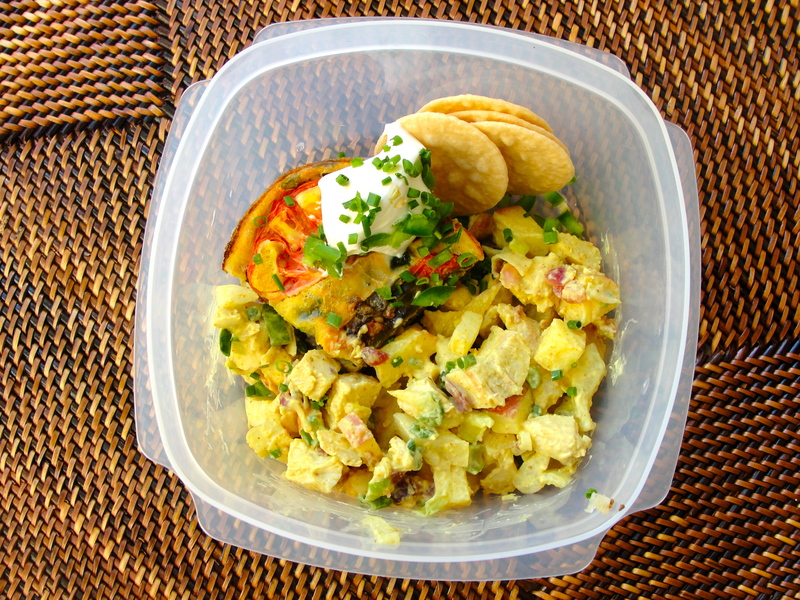 What leftovers are in your photo? They look delicious! Glad you asked! 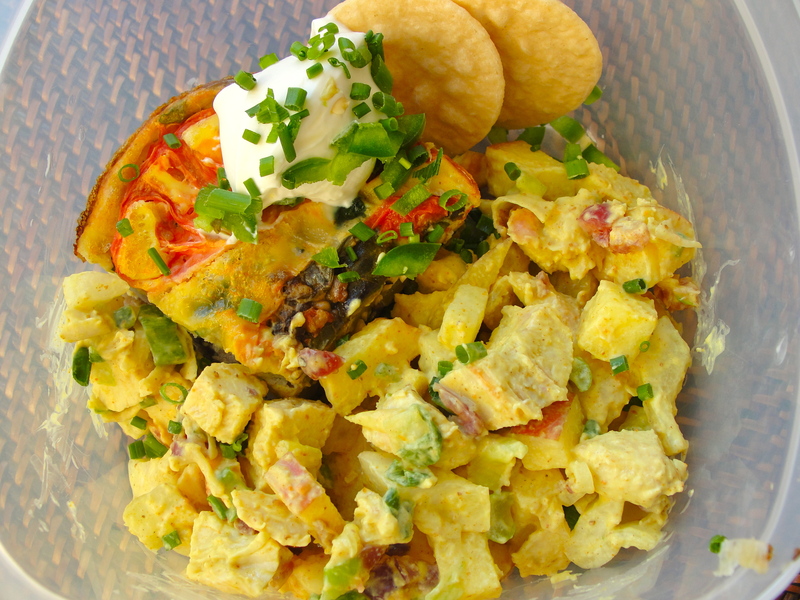 Low sodium curry chicken salad (http://sodiumgirl.wordpress.com/2010/04/09/pack-up-your-picnic/) and low sodium frittata, made by my mommy and mommy-in-law! Find them both on Sodium Girl! Boy talk about great minds thinking alike! I just posted about this same thing several days ago: Dinner at the Improv. I love being in good company. What dish – that you have made lately – was even better as a leftover (and DO include links if it is on your site)? I think chili or spiced couscous always develops extra yum when left to rest for a bit. : ^) Love left overs!! I cook extra for this very reason – and sometimes even cook a chicken breast or similar protein on Sunday just for the purpose. I love to mix a little protein with arugula or fresh spinach and maybe a few no salt garbanzo or other kind of no salt beans. Sometimes I slice a fresh mushroom or two into the mix – add a little cilantro or fresh parsley and Voila! Like you I enjoy putting all the goodies in one bowl! Oh and don’t forget how easy it is to whip up a pot of lentils for adding to the mix. Thanks for your continued wonderful site and posts.